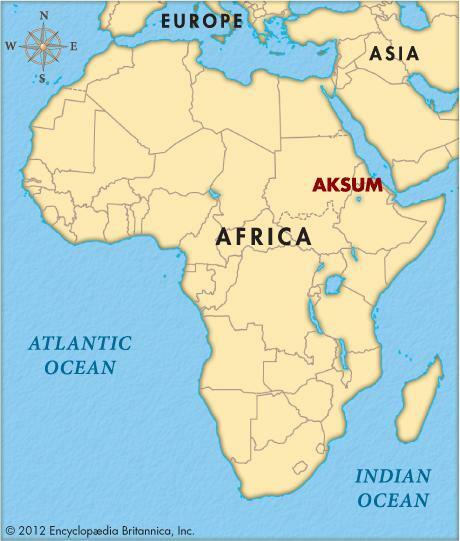 Aksum was a kingdom located in present-day ERITREA and northern ETHIOPIA between about 200 B.C. and A.D. 650. Its capital city of Aksum sat on the western edge of the Eritrean highlands and was for several centuries a powerful and wealthy city. Historians take a particular interest in Aksum because its ruler, Ezana, converted to Christianity in 340, shortly after the Roman emperor Constantine became a Christian. The form of Christianity practiced in Aksum, called Monophysite, was based on the belief that Jesus Christ was completely divine and not human. When the Catholic Church condemned this view in 451, many Monophysite Christians fled the Byzantine Empire (the eastern portion of the Roman Empire) and settled in Ethiopia. This group probably helped spread the faith among the local population. In fact, the modern city of Aksum still exercises a great deal of influence in the affairs of the ETHIOPIAN ORTHODOX CHURCH. Although the economy of ancient Aksum was based on farming and the tribute received from other lands, the main source of the kingdom’s wealth was international trade. Archaeological evidence and written records indicate that by 100 B.C. a series of towns connected the inland capital to the port of Adulis on the Red Sea coast. These towns formed an overland trade route for valuable goods such as ivory, tortoiseshell, and rhinoceros horn. Aksum grew wealthy from exporting these goods to trading partners along the shores of the Red Sea and the Indian Ocean. By the late A.D. 200s Aksum began to mint coins of gold, silver, and copper that made it easier to trade with other lands. Most of these coins have been found in southern Arabia, one of the territories that Aksum controlled. Aksum reached the height of its power and influence in the 500s under King Kaleb. Thereafter, the kingdom suffered a rapid decline and within 100 years of Kaleb’s death had lost its trading partners and the territories it had ruled. At the same time soil erosion and the people’s overuse of its natural resources weakened Aksum’s local economy. All that is left of ancient Aksum are the ruins of the capital, with its giant carved stone columns. These columns were probably grave monuments for the tombs of Aksum’s pre-Christian kings.